I had planned on walking you through installing the servers and importing the data in this article, but a few things have popped up which I think need to be addressed first. Some of you already have SBS boxes up and running and there are a couple of issues that have been plaguing me so I thought I would save you the grief I have been going through. First of all with the release of Windows XP is the matter of putting those new XP boxes on your SBS Network. Microsoft has recently released a paper on the subject called "How to Set Up Windows XP Professional Client in SBS 2000 Network" which is KB Article [Q316418] of course there is a gotcha. Even if you follow the recommendations to the letter you may find some of the new XP boxes can not complete a "Windows Update" session. 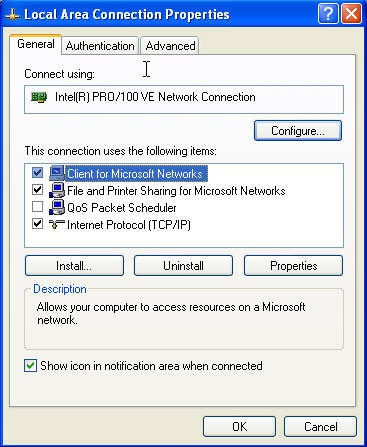 What you need to do in this case is open the Network Places properties window and find the icon for your Lan Connection. Right click on it and remove the check for the box by QoS. The default is for it to be checked. Un-checking it will allow "Windows Update" to complete. Back to installing the clients, personally I find it easier to just put the XP Box on the network using the first portion of the manual instructions and then use the "Add Software" function in the SBS Admin Console to add the ISA Client, the Outlook Client and the Modem Sharing Client. If this does not work for you then you have found the second issue I wanted to cover in this article. 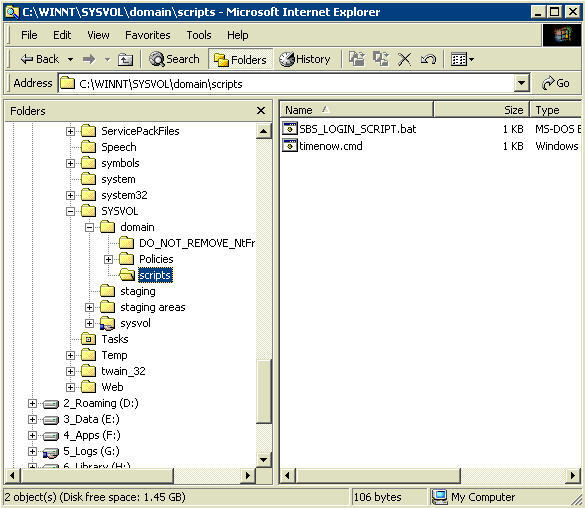 "C:\WINNT\SYSVOL\domain\scripts" and add CALL to the beginning of each line. Don't forget to leave a blank space after the word call. This will keep the login script from getting lost. This is an old DOS command which says to the system execute the line and return to the next line. You may find that the client software installer runs the next time each user logs on. This will only happen once if you let it continue it's installation. The next time they logon it will notice all the software is installed and continue on as normal. Looking for more tips and useful info about SBS? Check out Harry Brelsford's site at www.nethealthmon.com while your there you can sign up for his SBS newsletter. Harry is the author of Small Business Server 2000 Best Practices (reviewed here) a few months ago. See you next time and we will install the Servers, create the User Accounts and restore the Exchange Data.